As the first of four Senior Wellness Centers funded by the third iteration of the incredibly successful MAPS initiatives in Oklahoma City, Counsilman-Hunsaker worked closely with project stakeholders, the city’s program consultant, and the facility operator to confirm a building program that would serve the target demographic needs for a wide range of health, wellness, and social program offerings to the population of Oklahoma City. The new 40,275 sq. ft. building includes a heated indoor fitness pool, a full-sized gymnasium, fully equipped exercise room, an aerobics room, classroom space, a demonstration kitchen, an outdoor bocce ball court, art studio, café, lounge, and health screening room. Aquatics is a critical component of the overall program, and as such, Counsilman-Hunsaker was engaged to provide guidance and insight into how best to create an efficient multi-purpose body of water that would allow for a multitude of aquatic health and wellness activities to take place. Based on the program confirmation feedback, an efficient layout of 2,300 sq. ft. of water surface area was developed to provide four 25-yard fitness lap lanes with depths varying from 3 ft. 6 in. to 6 ft. 0 in. 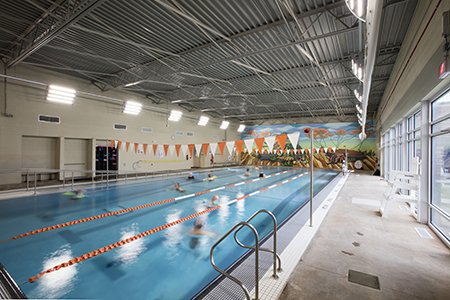 In addition to fitness lap swimming, aquatic aerobics, water walking, and other related wellness activities, the pool also provides recreational elements, such as water volleyball, water basketball, and underwater bench seating. 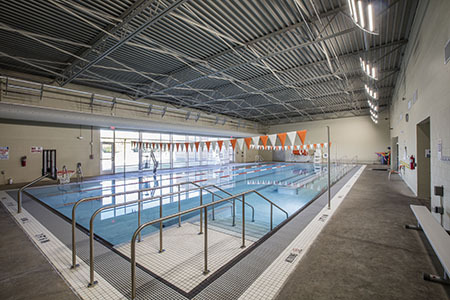 Three different types of ADA compliant ingress/egress are provided in the pool for maximum versatility. This includes a ramp entry, a stair entry, and an ADA compliant pool lift. 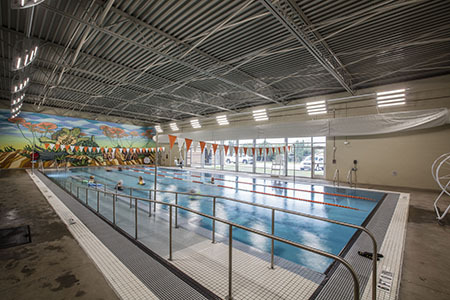 The pool is equipped with a state-of-the-art continuous perimeter overflow in a deck-level gutter configuration, and utilizes both on-site saline generation and medium-pressure ultra-violet light to maintain water quality and reduce the effects of chloramines within the natatorium space. LED underwater lighting is provided in the pool for increased visibility and to contribute to the aesthetic of the space. MAPS3 is a $777 million, debt-free capital improvement program to improve the quality of life in Oklahoma City.